The origin of Thanksgiving Day has been attributed to a harvest feast held by the Plymouth Colony. In 1621, Governor William Bradford of the Plymouth Colony proclaimed a day of “thanksgiving” and prayer to celebrate the Pilgrims’ first harvest in America the year after their arrival on the merchant ship Mayflower. The picture you usually see of a few Native American men joining the Pilgrims at the feast is a bit inaccurate, however. From original settler Edward Winslow in a letter to a friend in 1621, we know that some 90 men accompanied the Wampanoag Chief, Massasoit, to visit at Plymouth for three days of fish, fowl, and venison. But of the roughly 100 English settlers who had spent their first year on the Massachusetts coast, about half had died by this time. This would have left about half the 52 survivors as English men. So the Native men outnumbered the Pilgrim men by over three to one! The idea of the Pilgrims fleeing England due to persecution to come to America is not quite historically accurate, at least as the starting point. Rather, over a decade earlier they had already left England for Holland as Dissenters of the Church of England. They were not willing to comply with obligatory Church of England worship practices and were therefore subject to fines if they stayed in England. These Pilgrims were Puritan Calvinists in their theology and found the Dutch Calvinism more tolerant of their religious practice. However, they found that in Holland their children were forgetting how to speak English and were adopting Dutch customs too liberal for their sensibilities. Therefore, they intended to remove to America, having heard of successful settlement in Virginia, and hoped to arrive north of Virginia at the mouth of the Hudson River, in an area chartered to be called “New England.” The Mayflower was not a passenger vessel, but a merchant ship. The Atlantic passage was difficult, one passenger and one crewman died, and one baby was born. The Pilgrims disembarked Holland by way of England departing from Dartmouth, Devon and spent about two months crossing the Atlantic for the American coast. Weather was not their friend. There are several other accounts that compete for “First Thanksgiving” in America both in terms of date and location. Puritans: this group arrived in America from England 9 or 10 years after the Pilgrims and claim a thanksgiving holiday in Boston in 1631. Despite the two groups’ similarities, there are several notable differences and motivations for why they came, as I describe here. 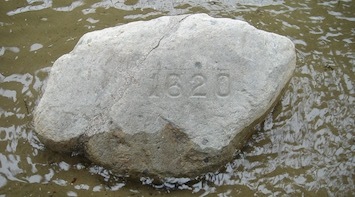 Irish: on February 21, 1621, a ship arrived from Dublin with food stocks at Plymouth Rock for the starving Pilgrims. The date differs from the aforementioned Autumn thanksgiving feast date. Spanish: more a religious service than a holiday, explorers in San Elizario, Texas held a thanksgiving feast in 1592. Other claims point to a Spanish celebration on September 8, 1565, in St Augustine, Florida. Virginia: the founding charter in Charles City County, Virginia by the Berkeley Hundred — the early Virginia Colony’s Berkeley Plantation land grant — pins a thanksgiving service to 1619. One of the first general proclamations was made in Charlestown, Massachusetts in 1676. President George Washington in 1789 issued the first presidential Thanksgiving proclamation in honor of the new constitution. During the 19th century, an increasing number of states observed the day annually, each appointing its own day. President Abraham Lincoln, on October 3, 1863, by presidential proclamation appointed the last Thursday of November as Thanksgiving Day, due to the unremitting efforts of Sarah J. Hale, editor of Godey’s Lady’s Book. Each succeeding president made similar proclamations until Franklin D. Roosevelt, in 1939 appointed the third Thursday of November, primarily to allow a special holiday weekend for the national public holiday. This was changed two years later by both Congress and the President to the fourth Thursday of November. Now you understand that scene in the movie “Holiday Inn” where the confused turkey jumps between alternative Thursdays in the calendar in November. The idea of a day set apart to celebrate the completion of the harvest, and to render homage to the Spirit who caused the fruits and crops to grow, is both ancient and universal. The practice of designating a day of thanksgiving for specific spiritual or secular benefits has been followed in many countries. Thanksgiving Day remains a day when many express gratitude to God for blessings and celebrate material bounty. P.S. I’ve often been asked if the British also celebrate a day of Thanksgiving. They do, but they mark it on July 4th.